The entire eSports industry is continuing with its rapid growth, but I guess you already know that one. 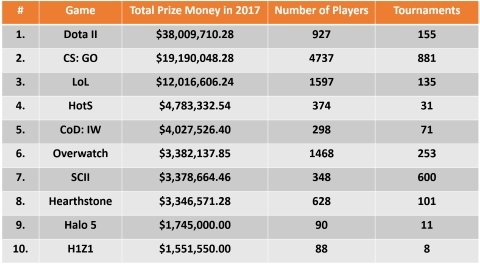 Well, what you probably don't know is in what particular order to various eSports franchises ranks up against each other in terms of overall distributed prize money. Well, that's exactly the topic which we will discuss today thanks to the help of comprehensive statistics gathered by esportsearnings.com. That's why you should sit back, relax and take a closer look at the full list of top 10 eSports of 2017! Now that you have inspected the list below, here are some further explanations. They might come in handy and help you understand it better. First of all, you should know that the overall prize money distributed through all eSports has been exponentially growing in the last couple of years. In 2017, the total number exceeded the $100 million mark, sitting strong at $109 million overall. As for specific eSports titles, DotA II still doesn't have a proper competitor. It's the clear winner 4th year in a row now and nothing can seem to put an end to its reign. It's all thanks to the crowd-funded The International tournament which breaks prize pool records every year. Throughout its 7 years of existence, The International has distributed more than $80 million in prize pool money. If that's not an admirable number then I really don't know what is. As a matter of fact, The International 2017 paid up $24 million which is more than the total number of CS:GO as a franchise. Yes, Valve is reasserting its dominance with 2 of their eSports franchises (CS: GO and DotA II) being placed at the 2 top spots. Furthermore, They are backed by League of Legends which is slowly stagnating; distributing just over $12 million. The hottest new arrival, PUBG, has fallen short of the top 10 list. More precisely, it sits on the 19th spot with close to $800,000 through a total of 9 tournaments.